US national Chad Elwartowski and his Thai girlfriend, Supranee Thepdet (aka Nadia Summergirl), are facing charges of threatening the Kingdom's sovereignty. Last Sunday officials from the Royal Thai Navy and Phuket Maritime boarded the structure saying it violated Article 119 of the Criminal Code and also posed a navigational hazard. The couple launched the 'Ocean Builders' seastead on February 2 off the coast of Phuket. The structure is located to the southeast of Koh Racha Yai, approximately 12 nautical miles (22.2 kilometres) from the mainland. Elwartowski has claimed that his seastead is outside Thailand's territorial waters, but Thai authorities insist that it violates Article 119 and challenges Thailand's territorial rights. Besides the disproportionate response, most telling is that Thailand has not even bothered to claim that the seastead is within their territorial waters. The couple previously inhabiting the seastead has fled in fear of their lives. Immediately Thailand shows what's really going on - whatever theory of state recognition you subscribe to, it all unfortunately returns to violence and the control of violence - control of it within your territory (the police, to maintain order) and outside your territory (the military, to prevent conquest.) If your country can't do those two things, it's not a country, and can't even convincingly pretend to be a country for long. An objection: Luxembourg appears to be a viable state, yet can Luxembourg really claim to be able to repel an invasion from Germany or France? No, but very likely the blowback from other countries in the mutual-recognition-cartel that could harm Germany or France in some way is enough to stop them. Dictators often test the resolve of the cartel - most obviously, Putin by invading Crimea. Ukraine could not repel such an invasion, nor could they count on the cartel to come to their aid. So they can say that Crimea is still part of Ukraine, but de facto, it is part of Russia. In actuality, the Thai seastead isn't the first one. This is stated not to diminish the accomplishment, but rather to point out that there was another would-be sea-platform microstate in the 1960s, which was allowed by nearby nations to persist - though they may have been a bit nervous about this and hope to escape the UK's attention. Consequently we might ask - why don't seasteaders set up shop off the Somalian coast, most of which has no real government? For the obvious reasons of piracy! In this, it's obvious that seasteaders would like to benefit from the nearby state's violence control, without paying taxes or following other rules. (In fact, Sealand had difficulty controlling violence within its borders, or preventing criminal behavior, and the UK's hands-off attitude had a lot to do with that.) A critique of "fundamentalist" little-l libertarianism in general is that it's only conceivable when there is already a state regulating commons and controlling violence that guarantees social arrangements - and a very similar argument can be made for socialism in states already wealthy-by-capitalism, also an unsustainable strategy. It's probably not good for anyone to dwell for too long on the basic fact that humans have never devised a system to organize themselves beyond the level of a family without a threat of violence, and it seems that theories of state recognition are designed to be legalistic dances that distract us from this brute fact. The political scientist who imagines a system that allows the non-violent creation of new states that can actually take natural precedence over force will go down as the greatest philosopher in history - along with the one that figures out a way besides physical space to determine which laws apply to which people, thus making a more truly voluntary society. I'm very sad for the couple that tried to seastead off of Thailand, but they were more than a little naive. For now, I predict that any seastead, even one far out in the middle of the ocean inarguably beyond international waters, will quickly find itself dismantled by a state navy unless they have sufficient outward directed force - and will not be able to control their internal violence without pre-emptive threats of violence. Early states tended to emerge in places that were actually somewhat marginal for agriculture, quite counterintuitively. (Most recent discussion here.) When combined with the example of China (which is not at all marginal for agriculture), the connecting argument that emerges is that states appear where central coordination of labor is required for agriculture, there is a benefit to population, and a centrally organized society develops. This can occur either because of marginal conditions (e.g. timing the flooding of a river surrounded by a vast desert) or difficult crops that require more central coordination, e.g., rice. Conversely, in places where the land easily produces calories, there is little benefit to central coordination, as dissatisfied "citizens" can easily refuse to cooperate and move away, and not lose any benefit in terms of population growth. One way to test this would be to look at political stability within an early state - within a single early state - and how stability correlates with agriculture-favoring (or -disfavoring) climate changes. This hypothesis (CLAHSF) would be falsified if improved conditions outside the central areas of a state improved state stability, and if worsened conditions outside the central area de-stabilized the state. Ola Olsson from the University of Gothenburg shows that in fact, when the ancient Egyptian "hinterlands" received better rainfall (which improved agriculture in a desert climate), there was a delayed de-stabilizing effect on the Egyptian state, "since the decline in effective circumscription provides the farming population with an outside option in the hinterland." Ola Olsson (University of Gothenburg), "Pharaoh's Cage: Environmental Circumscription and Appropriability in Early State Development", IAST General Seminar, Toulouse: IAST, March 29, 2019, 11:30–12:30, room MF323. By "outsider" I mean "people whose behavior is perceived to differ in morally important ways". Those morally important ways are often things like what moral authority you follow, supernatural or otherwise; what you eat; sexual practices; and boundaries of socially sanctioned violence. You can be perceived as an outsider because you are of a different ethnic group, political system or party, or religion, among other things, whether or not your behavior actually does differ. This seems to offer hope, in case the perceived differences can be found to be mere labels with no real differences in behavior. But that is not always, or even usually, the case. It's not just perception; there are morally important differences. Either a man laying with another man is moral, or it is not. Either violently taking property from the bourgeoisie is moral, or it is not. Either honor killings are moral, or they are not. And inspired by an example from Robert Frank's Choosing the Right Pond: either it is okay to eat ponies, or it is not. It is very difficult to see what a mutually beneficial coexistence might be for people with conflicting views of these things. a) there are genuine differences between groups of humans in moral behavior b) this forces a choice as to whether morality extends to a morally different group or not c) if we are living with a morally different group, they may not want your morality extended to them; if you don't extend your morality to them, you are implying that they are not human. This is a dismal hypothesis, as these three ways are obviously sub-optimal for human dignity and the functioning of a modern multi-ethnic state, so it is imperative that we understand them, and possibly find new ones. This could be called either the triune theory of moral resolution, or ISE (sounds like "ice" - for Ignorance, Sub-humans, and Evangelism.) They are as follows. 1. Ignorance - for most of the lifespan of our species, humans have lived in small hunter-gatherer groups. Consequently we were spared from having to deal with outsiders. Even if you know they exist, if you don't have to interact with them, then you don't care that much how they behave. You might still interact with them minimally, transactionally, through trade* - often on neutral ground, and possibly not even sharing a common language. (When we behave transactionally, we're calculating and not engaging most of our social cognition.) They don't sleep in your territory and don't eat at your table, or only in settings which are carefully controlled by the tribe or state and prevent extensive contact between populations. Although the ignorance "non-strategy" obtained throughout all of pre-history, starting in the Neolithic this strategy was no longer stable, as some populations began to expand into their neighbors. Most subtly and softly, as is often the case in modern states - you might even be horrified at the suggestion that you're capable of this, but there are groups of people in your society for whom you've drastically lowered your expectations. The Ottoman strategy of governing people, allowing a multi-confessional empire, seems quite modern in some ways - but I'm sure most people in the capital didn't regard with admiration the pork-eating Christians they allowed confessional self-governance. You may even have caught yourself, in the pony-eating example above, finding reasons to excuse the pony-eaters from full moral evaluation, though I doubt if you were told you were invited to a pony-eating party you would be excited. We also sometimes categorize people in our own society as sub-human, usually based on class. The upper classes do this with the lower classes to explain why they "under-perform" (but might also try to evangelize them about how to improve, i.e., be more like the upper class.) The lower classes do this to the upper class to explain why the upper class has more money - it's because they're amoral, with bizarre practices behind closed doors, and they have lots of dealings with dirty foreigners. The lower class never evangelizes the upper class, because this exposes that the lower class in the end would actually want to join the upper class, and exposes their self-comforting fiction. In some cases sub-humanism can be "escaped" by assimilation, which requires both the desire of those considered sub-human to be accepted by those considering them sub-human, and those considering them sub-human to want them to escape. Usually, escape is not possible, either because 1) the basis of sub-humanism is some immutable quality (i.e. ethnicity, religion) and/or 2) because the people who would have to accept them have no mechanism to do so, i.e. there is no evangelism. As mentioned, sub-humanism is the default option when morally differing people move out of the "ignorance" category, and this transition is all too easy. Very often this is discovered by traders who have overstayed their welcome. In the current populist surge, we are witnessing discussion of "globalists" now, either outsiders, or people tainted by outsiders through business loyalties. Persian merchants were slaughtered during the Guangzhou massacre for explicitly this reason. The Dutch merchants living near Nagasaki during the Tokugawa Shogunate never made the ignorance-to-subhuman transition because the Shogun kept them sequestered on an island, consistent with state practices that repeatedly appeared in history to keep the population ignorant. 3. Evangelism - or, assimilation. This is a more difficult strategy in the sense that it is not innate to humans, but it has been very effective for expanding empires to retain stability. In this strategy, you recognize your neighbors as human - and want to help them! (To avoid Hell, become more economically successful, etc.) So you Christianize them, or send advisors to make them more capitalist/communist, or otherwise "civilize" them in general, etc. Witness Thomas Jefferson's well-meaning attempts to civilize native Americans, the British white man's burden to educate and develop Africa, and the USSR's attempt to export revolution. Compare the evangelical religions (which appeared later in history) to the non-evangelical, and emphasize brotherhood in the faith over national origin. Obviously none of these were done with purely altruistic motives, but the impulse to assimilate rather than exterminate is on plain display. Can There Be Any Solution? The hypothesis can seem worrisome in the sense of unfalsifiability. It's tempting to play the game of putting every interaction between morally differing people into one of the three boxes - "Are you aware of their existence? You're not ignorant of them then. Do you think what they're doing is wrong, or not care? You consider them sub-humans. Do you want to help them? You're evangelizing." Indeed, most such interactions really do fit. We will hopefully never go back to being ten thousand disconnected tribes, able to ignore each other's differences. Go into the London Stock Exchange – a more respectable place than many a court – and you will see representatives from all nations gathered together for the utility of men. Here Jew, Mohammedan and Christian deal with each other as though they were all of the same faith, and only apply the word infidel to people who go bankrupt. Here the Presbyterian trusts the Anabaptist and the Anglican accepts a promise from the Quaker. On leaving these peaceful and free assemblies some go to the Synagogue and others for a drink, this one goes to be baptized in a great bath in the name of Father, Son and Holy Ghost, that one has his son's foreskin cut and has some Hebrew words he doesn't understand mumbled over the child, others go to heir church and await the inspiration of God with their hats on, and everybody is happy. You might object that a transactional relationship is not a full one, and you would be correct. Here we can take advantage of the millions of people who we live among in the modern age - you don't have to interact with every single member of your society, and the ones you choose to interact with, you choose at what level you do. *A complicating observation of tribes (usually not nations) who are ignorant of each other is that one of the transactional "interactions" can be warfare. In traditional tribal warfare, there are ceremonies, there are few casualties relative to what might otherwise have occurred given the technology available, and there are agreed-upon conventions: we don't fight each other when it's raining because our warpaint runs off; we stand in order lines and kneel and fire our muskets because only cowards hide behind trees like savages; etc. (See the Aztec Flower Wars for a well-documented example.) Every so often we witnessed a sudden transition from traditional to modern warfare, with a disregard of previous conventions and much higher casualties (or even extermination; see here for discussion of this in Iroquois and Mongols) that in this framework represents a transition to sub-humanism. As with trade, in traditional warfare, you remain basically ignorant of the other tribe because you have very limited "interaction" with them. The complication is that clearly there must be some cultural norms shared between the two tribes for this arrangement to occur, although again, interaction is quite limited other than at the highest level of the tribe or state. The first European set foot on what would later become the United States in 1513. The last uncontacted indigenous person was captured in 1911. 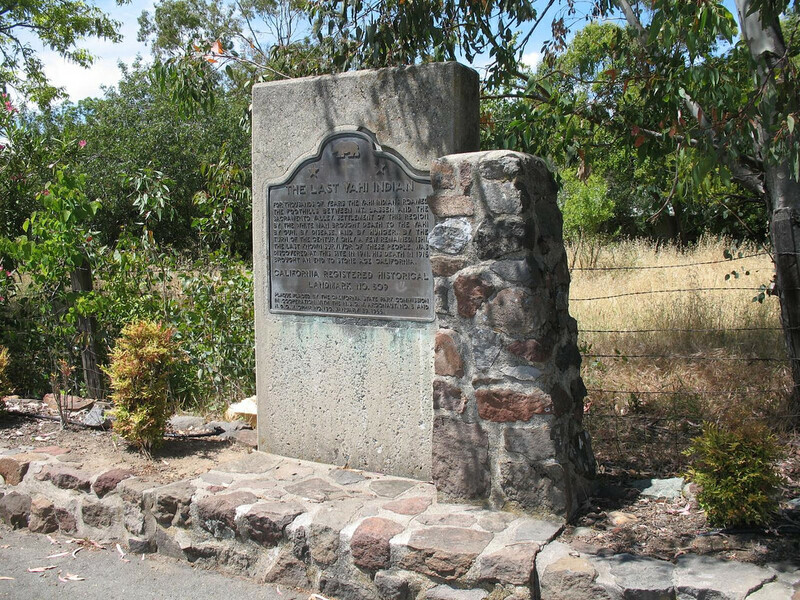 Many people are familiar with the story of Ishi; the picture above is of the monument commemorating the place in Oroville, California where he came under the power of European-descended people. (Image credit to Ray_Explores on Flickr.) This marker commemorates not just Ishi, but the date and place at which an entire nation's worth of indigenous people had finally been completely assimilated or exterminated - on August 29, 1911. This means that there's an annualized assimilation rate for the United States of 4.1% over those 398 years. Obviously the size of the territory matters; I tried to find a similar event in the history of Canada but could not. With more than one country, we could get an idea of how the territory affects the rate. Although it's not a conquest in the same way, it's noted here that the time for Germanic people to take over the former Roman Empire was about six centuries. How Do People Decide Which Experts to Trust? A summary of the aim of modern propaganda is this: dictators don't do propaganda so people believe something but so they believe nothing. And more importantly, do nothing. In a modern society, no one individual is in a position to evaluate every scientific, medical, or political claim we hear, so we rely on experts. A central technique for saboteurs of public discourse is to undermine confidence in experts. It's therefore important to understand how people actually evaluate experts. This is an important tool not only for understanding propaganda attacks from Russia and other governments, but critically analyzing our own responses to expert opinions, especially ones we're inclined to disagree with. It also provides a way to understand why someone might listen to a celebrity instead of a scientist, if the belief in integrity and benevolence outweighs the expertise factor. A 2015 paper by Koyama, Moriguchi and Sng (KMS) builds a model based on modern China and Japan's different experiences, suggesting a mechanism for how external threat and internal political and geographic characteristics drive centralization, as in Japan's case - or makes the state collapse, as in China's case. The small states either centralize to defend against the external threat or cease to exist, and due to their size, centralizing is not so difficult. The large states might not centralize, since there may be local disincentives that the central ruler cannot overcome. Consequently by the early twentieth century, the Japan (feudal a mere century before) emerged as a great power, and China (a centralized rich empire a century before) collapsed. KMS give statistics about railway-miles built per decade as a proxy for overall modernization, of course, referring to the dismantling of the Woosung Railway by the Qing. This is intriguing, because it is not only consistent but complementary with the "labor-intensive agriculture drives state formation" hypothesis, and gives us a fuller picture of the appearance of the first states and their subsequent spread. The marginal agriculture hypothesis of state formation (MAHSF, pronounced "MASH-F") observes, again counterintuitively, that the first states (originating in a political analog of "spontaneous generation") tend to emerge in places which are actually quite marginal for agriculture. Like: the Nile Delta in the Sahara, which has to be irrigated in a time-sensitive and labor-intensive way; or, the Fertile Crescent, fertile only (again) if it is irrigated. Or the dry central Mexican highlands, or the Peruvian Andes. Not the plains of southeast Asia, or the Pacific Northwest, where even hunter-gatherers could develop a rich material culture. But on consideration, MAHSF has an obvious flaw, which is China. (Any theory of state formation that does not account for the emergence of China is not a theory of state formation>) China was founded on fertile wet plains still today used for rice cultivation, and the exception shows that it's not a marginal physical environment, but rather the requirement for centralized labor, which played chicken-and-egg with centralized state capacity. Consequently a better account is the coordinated labor in agriculture hypothesis of state formation (CLAHSF, proncounced "CLASH-F.") It doesn't matter whether you live along a river in the desert and have to centrally organize labor because of the marginal environment, or you unfortunately have chosen a "tyrannical" crop like rice which places similar demands on its harvesters. In such a setting, advantage goes to the group that can organize labor, and the population and the state grows. CLAHSF explains why states emerge in certain places, and KMS provide a mechanism for how state formation "spreads" from those original nuclei. In the Old World, there are basically two nuclei and three vectors: from the Middle East to Europe and the Mediterranean; from the Middle East east along the Indian Ocean; and from China to the rest of East Asia. You'll notice the absence of Egypt, but modern Europeans, North Africans and Middle Easterners are much more the inheritors of statecraft and culture in general from the Fertile Crescent than from Egypt. KMS apply their theory beyond China and Japan and look at both Anglo-Saxon England (ultimately unified by Alfred in response to Norse invasions) and Muscovy (in response to the Mongols; and Russians still psychologically think of Ukraine as a buffer state - the "Wild Fields" - since the Mongols easily crossed prairies but halted at the boundary of the boreal forest.) A third example that cries out for such a treatment would be the first unification of India after Alexander's arrival at its frontier; not to mention the seeming counterexample, why the Greeks, even after a long-standing threat from the Persians, never did manage to unify and remained a set of city-states - to be over-run by Alexander. An entirely different question is why China, which to this day can be seen as the amalgamation of ethnicities it is (with the Han dominating in the east) unified so early, and essentially stayed unified under different rulers (as if the Roman Empire had never fallen), when Europe had one such period early on, which was never repeated (a Warring States period that never ended.) Thought experiment reversing this here. Koyama M, Moriguchi C, Sng Tuan-Hwee. Geopolitics and Asia's Little Divergence: A Comparative Analysis of State Building in China and Japan after 1850. GMU Working Paper in Economics No. 15-54, 19 Nov 2015. Night City was like a deranged experiment in social Darwinism, designed by a bored researcher who kept one thumb permanently on the fast-forward button. Fads swept the youth of the Sprawl at the speed of light: entire subcultures could rise overnight, thrive for a dozen weeks, and then vanish utterly. And here Gibson did what science fiction does best - straight-line extrapolation, which often fails, as it did here. My own youth subculture was metal (which drags on into old age for many of us.) But rather than accelerating in their life cycles, subcultures seemed to disappear as a cultural phenomenon. I realized this when I was passing through a very small remote town in the western U.S. on a vacation in 2008, saw a gaggle of teenagers with metal shirts and trenchcoats by the side of the road, and realized that I hadn't seen such an assemblage for years by that point. I speculated about the mechanism here. David Chapman at Meaningness has an explanation which, while not necessarily in conflict with this mechanism, is much broader and relates the phenomenon to modes of developing meaning, understanding of morality, and explains why a counterculture appeared, then subcultures (a "native" mode prevalent from 1975-2000 for Gen Xers), then the atomization of youth culture in the aughts. The full chart is here (you REALLY should view and consider it), but the specific discussion of subcultures is here.